The foundational principles of the OODA (observe, orient, decide, and act) loop have been in effect for as long as people have been making decisions. The difference today is that we can apply analytics to problems to resolve data challenges and accelerate the loop. Some of the most sophisticated organizations in the world are tapping into their titanic data stores to improve operations, reduce down time and save money. 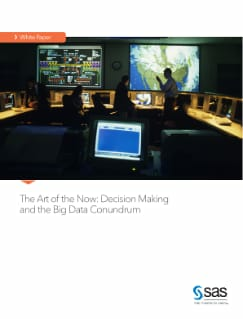 Learn how applying analytics at the point of decision – at an appropriate scale, speed and accuracy level – can help you gain and keep operational advantage over your adversaries.